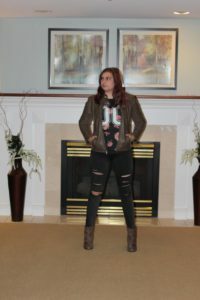 This week I am trying a new technique and introducing a fashion lookbook! What is a lookbook though? Typically, a lookbook is meant to showcase any type of creativity showing off a model, style, photographer, or a certain stylist or clothing line. A lookbook includes collection of photos dealing with a similar style, trend, or pattern. In this case, I am using a lookbook to display how different leather can look within different outfits. It is the perfect time to bring out all your leather clothing – jackets, pants, shoes, accessories; the weather is changing and so are the fabrics and textures we are wearing. Personally, leather is one of my favourite textiles to wear or experiment with because of how versatile it can be. Clothing Manufacturers have to consider aspects like this too when it comes to creating these items of clothing. We have pieces like these because high-street stores know that they will sell, especially if it affordable and good quality. I can’t wait to experiment with this trend over the coming months. I’m already obsesses right now! It also helps that it almost always makes an outfit edgy which I am all for. 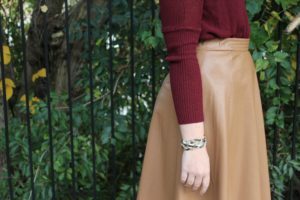 Wearing leather is something we all love to do every now and again, but depending on how many leather items you own, you might wear leather much more regularly. If so, you might want to find some new ways for you to take care of your leather, such as finding a brand new leather conditioner so that you can maintain your leather items. I have constructed four very different styles for outfits in preparation for this lookbook. 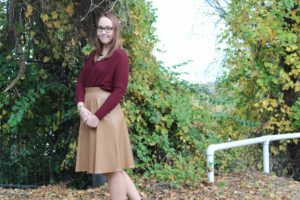 This outfit demonstrates how the use of leather can be made to look professional. Some people only think leather as casual or too edgy where it can not be used in a professional manner. However, the use of leather can be the perfect way to make your business casual more trendy. A simple way to accessorize is by the jackets we wear; add leather to that mix and you can easily create a trendy and edgy look to your casual outfit. 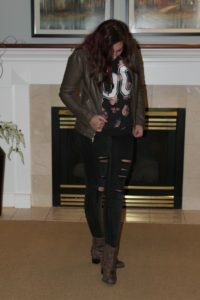 My outfit was pretty simple – ripped jeans, a floral sweater, and a pair of booties – however, by adding the leather jacket, I was able to channel some boldness into my look. Leather jackets can also be a good source of warmth. Even during the cold night, I was kept pretty warm with my jacket. 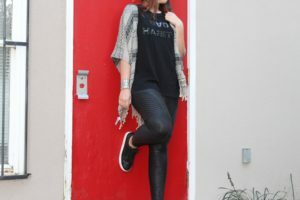 I think having a pair of leather leggings or pants (I have both) can be beneficial when looking for something to add to the outfit without being overpowering. You can style leather bottoms with a casual tee or tuck in a bottom-up to make the outfit look more professional. The great thing about leather is that you can dress it up (or down) to how you like without it looking odd. Do you feel like something is missing to your outfit? 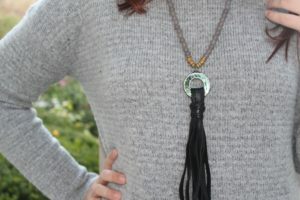 Add a piece of jewelry to your look; and while you are at it, go one step further and make that piece leather. A leather piece can make your outfit more exciting and unique.